Of course in the game story there is the Pig Star named after the Death Star in original Star Wars movies. If you are a fan of Star Wars movies, you will get enjoying this Windows 8 Angry Birds starting from start with different versions of well known Star Wars musics. The free Angry Birds Star Wars game provides games on Tatooine, Pig Star (Death Star), Hoth, Path of the Jedi and as bonus unlocking the C3PO and R2D2. May the birds be with you! Angry Birds Star Wars edition is an arcade game with about 40 MB download size where Windows 8 users can install it from Windows Store. 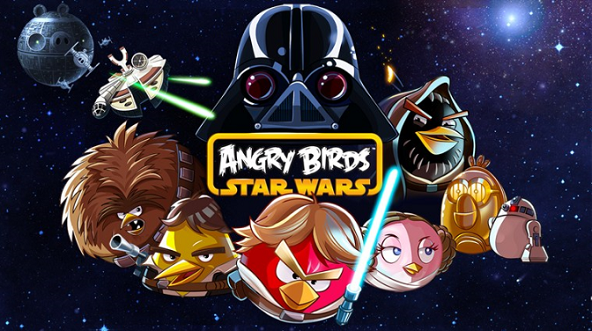 You can also use http://www.angrybirds.com/starwars/ to download Angry Birds Star Wars game to your Windows 8 tablet PC, or Windows Phone 8 smartphone, or others like Android, iPhone and iPad devices too.